Holy moley! Nearly forgot about Frugal Friday, what with the kids now being sick FOR A WEEK AND A HALF! Before reaching for Drano the next time your sink or bathtub is clogged or slow-draining, head for the closet! 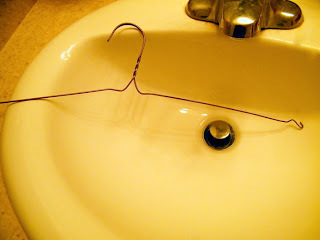 We took a wire hanger and removed the cardboard tube to make our very own homemade drain snake. My husband has used this to remove a very hairy monster from the bathtub drain (from where would such hair originate?? ), and I used this just two days ago to jostle the drain in one of my bathroom sinks. That drain went from completely non-draining to normal function with just a few pokes from this fanschy wire contraption. To avoid running out of wire hangers, keep your new gadget in the garage with the rest of the tools, so you don't have to keep making a new one every time you get a new clog. You'd be surprised how many snakes we made before finally figuring this one out! Remember that drain cleaners over time can corrode some pipes (and some wallets). Turn to your homemade drain snake first; it may be all you need most of the time. Oh! That's smart, I hadn't thought of it. I'm not looking forward to seeing the hair ball come out, but I suppose it's better than wasting tons of money on Drano. I'll have my puke bucket handy. =o) Thanks! You will need to get a professional that can take care of the problem the right way, ensuring that it doesn't happen again. That's really all there is to it, when you really think about it.